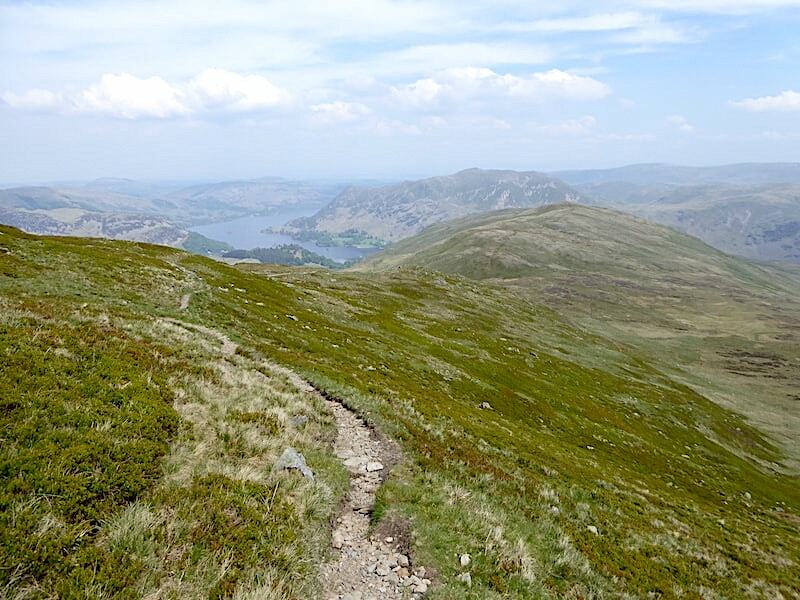 The good weather continues so we are out on the fells once more, although why we chose to climb a route well in excess of 2200′ on a very warm day I have no idea. I don’t think we even considered it, it just sort of happened. With the air coming up from the south we knew there would be some haze around and the long distance views would be compromised but what the heck, let’s just get out there and enjoy whatever is on offer. 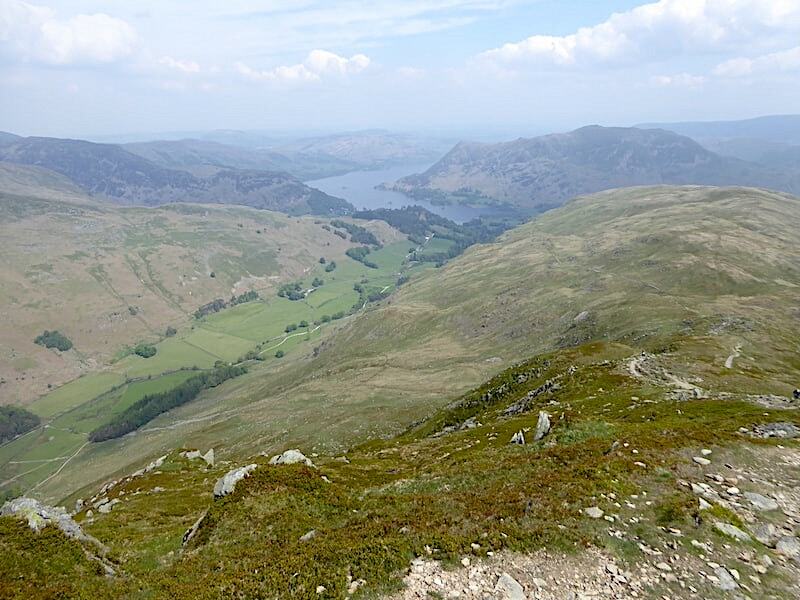 Once we were under way out of Patterdale we only encountered three other walkers and we didn’t see them again, or anyone else for that matter, once we had left the summit of Saint Sunday Crag. There were plenty of cars parked in and around Patterdale so perhaps the good weather had lured other walkers up to the Helvellyn range while things were set fair and the cloud was high. 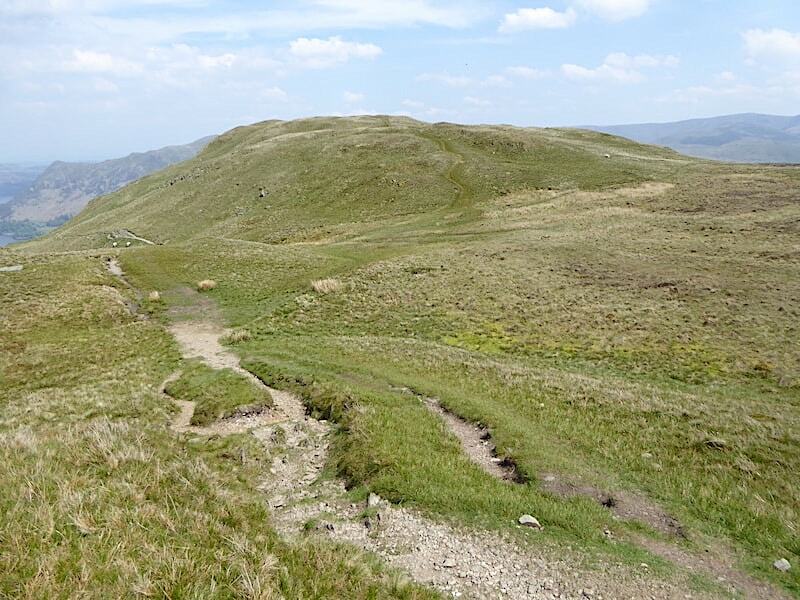 If you’re here on a week’s holiday and you get the chance of a cloud free walk up Helvellyn you’re not going to let it go to waste, that’s for sure. 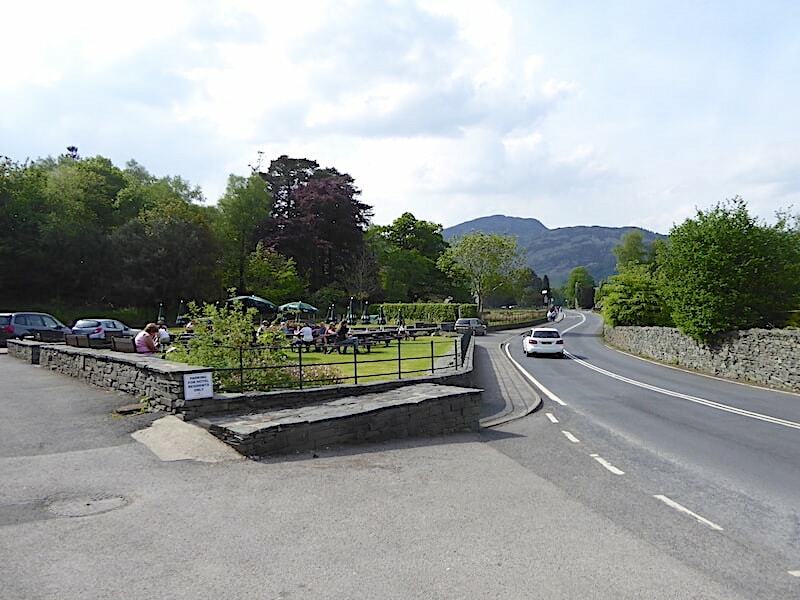 The White Lion car park in Patterdale has had something of a makeover recently with picnic tables, parasols and container plants arranged on both sides of it. A large sign at the entrance clearly states that the car park belongs to the pub and that parking has to be paid for, with dire warnings that non-compliance will result in vehicles being clamped, charges being incurred and all the rest of it. Just to ram home the message, you can’t miss the large white lettering painted on the tarmac at the entrance either, again informing drivers that the car park is the property of the White Lion. It all looks very pretty pretty but we did wonder how many people would make the effort to walk back to the pub, buy the drinks and then walk all the way back, along a busy road with very little by way of pavement on either side of it, to the picnic tables with a tray full of drinks. All the prettification has inevitably resulted in a reduction in the number of parking spaces. We didn’t even bother trying to park here, there is a decent sized parking area just after the Patterdale primary school with all day parking for £4.50 so that’s what we used. 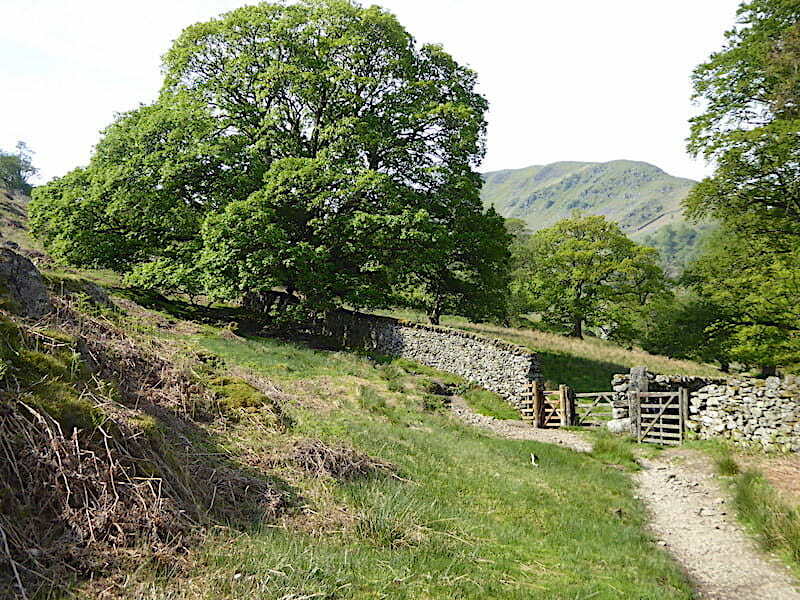 We walk up the lane between the White Lion car park and the village store, follow the dry and dusty track past Mill Moss and arrive at these gates where we pass through the handgate into Glenamara Park. 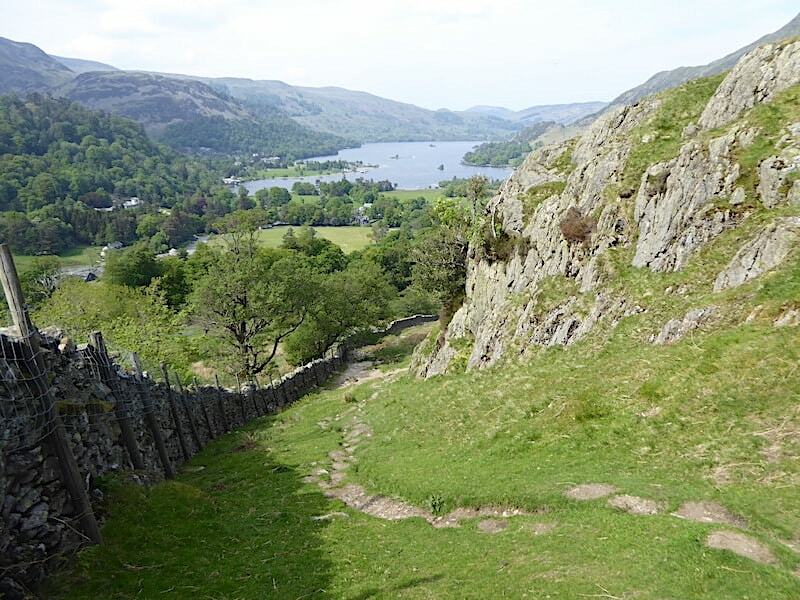 The path on this side of the gate continues on very steeply up to Arnison Crag. 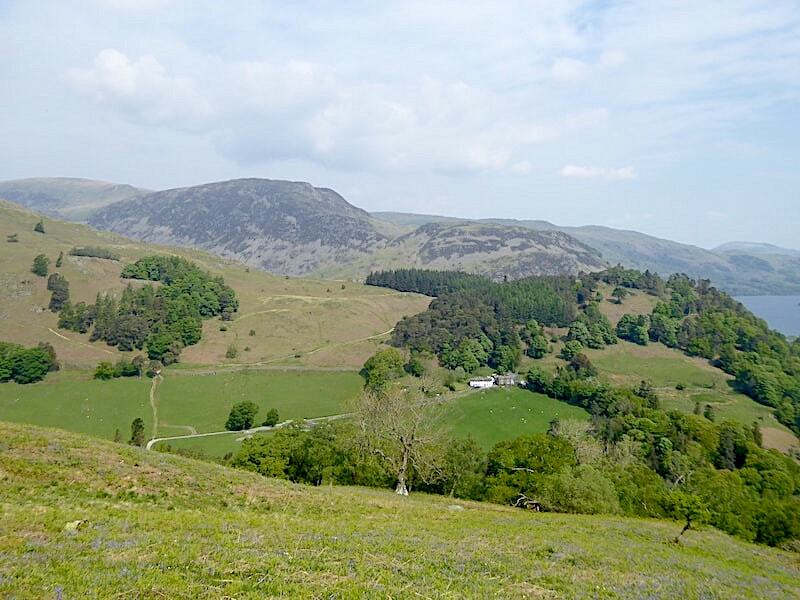 We have a steep climb ahead of us too but before that we can enjoy a quiet stroll through the gentle landscape of Glenamara Park. Walking the path through Glenamara Park with Birks directly ahead of us. 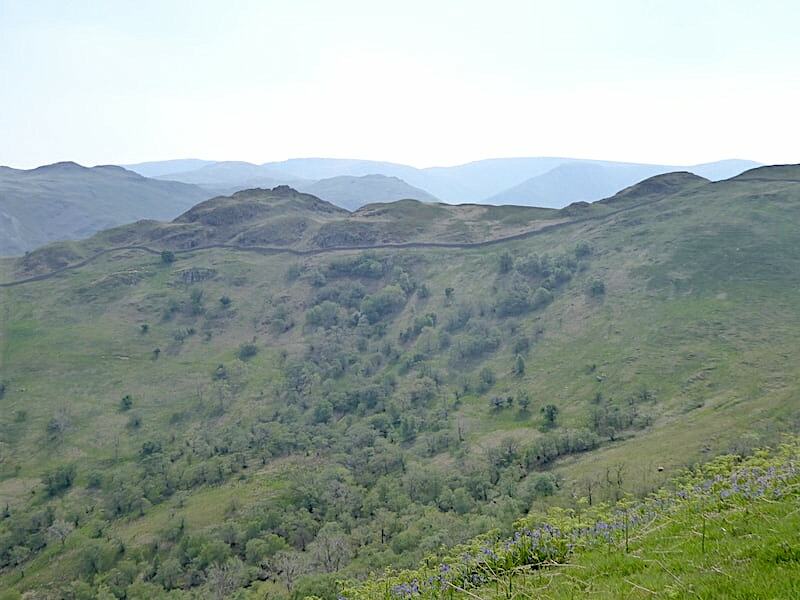 The hawthorns are in full blossom and the grassy slopes of Thornhow End are speckled with patches of lilac blue. 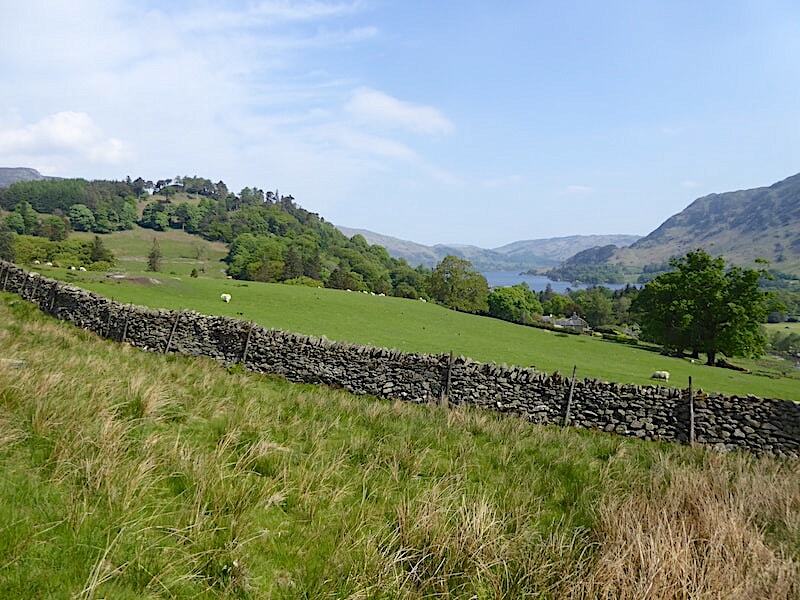 A look to our right offers just a tantalising glimpse of Ullswater at the moment, but the views of it will get better and better as our walk progresses. The crossing at Hag Beck was somewhat re-arranged during Storm Desmond but the stepping stones survived although it wasn’t really necessary to use them today. 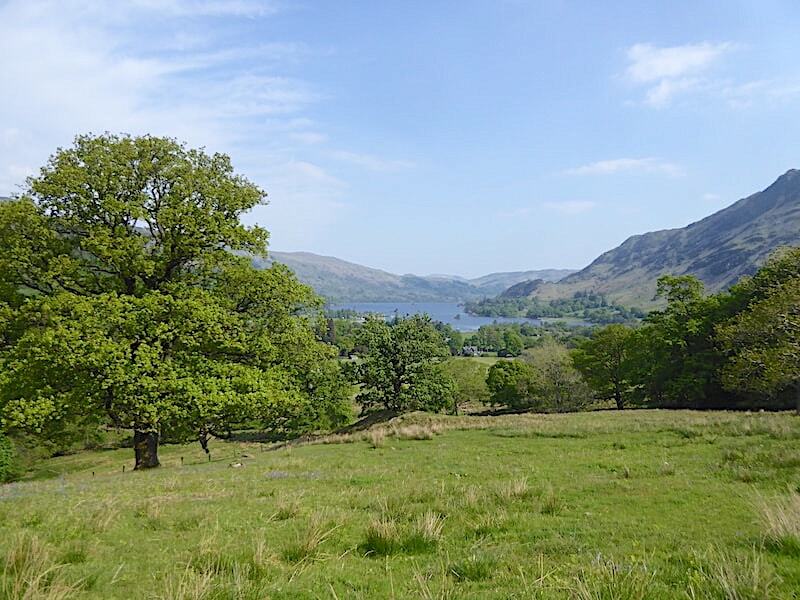 The path meanders through the park, here we can see Keldas, the low, tree covered hill on the left, which offers some lovely views of Ullswater and its surroundings. 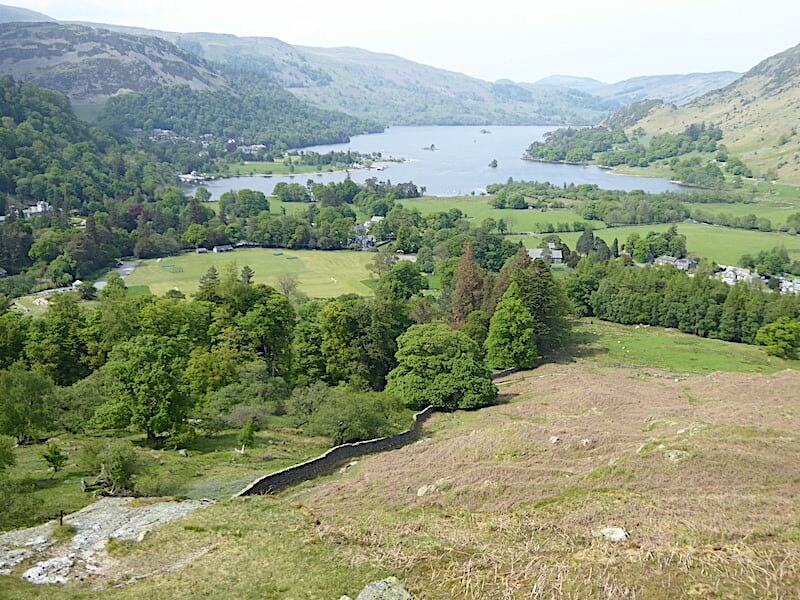 Its an easy, short walk up from Glenridding needing very little effort yet giving much in return. Just the place for a family picnic on a sunny Sunday afternoon. 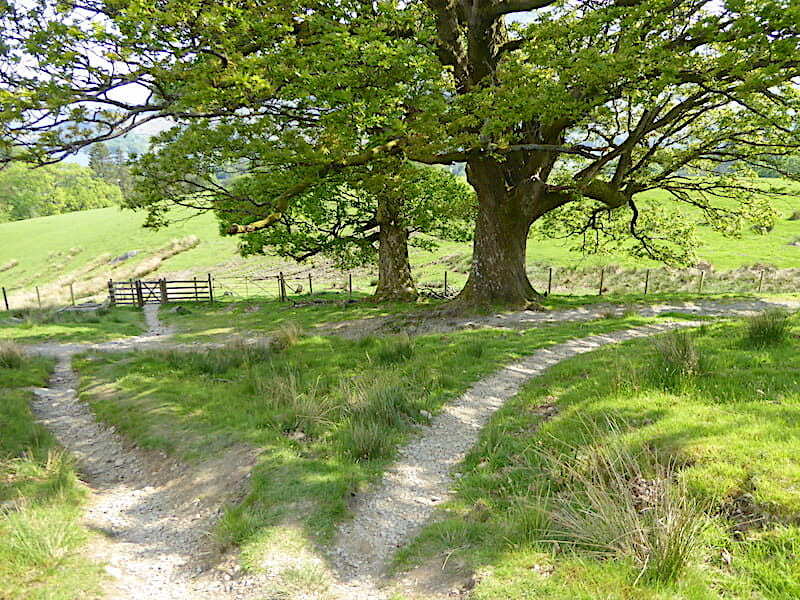 The path continues on into Grisedale but we branch off it here at the two old oak trees, here endeth the gentle warm up through the park and …..
….. and here beginneth the heavy lifting. 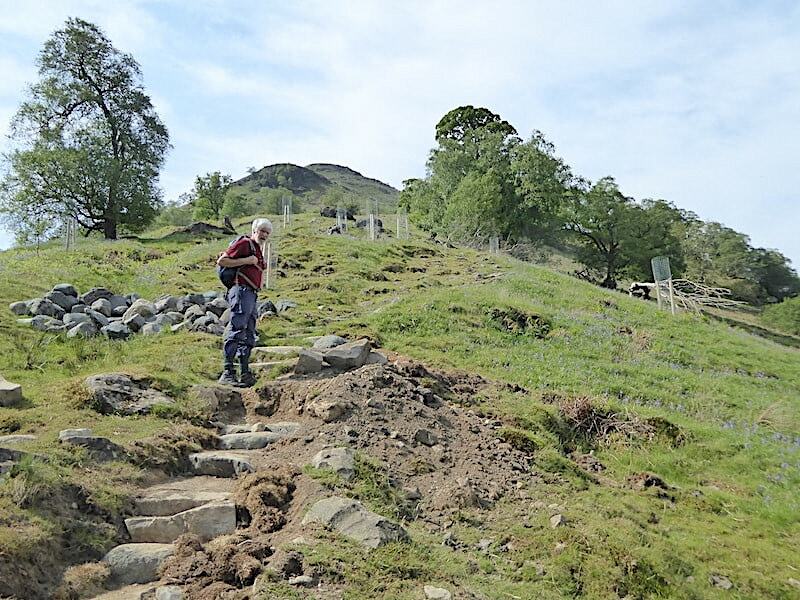 Path repairs are taking place on Thornhow End but because the stones are not yet securely embedded let’s hope that we don’t get a few heavy downpours before the repairs are finished, it wouldn’t take much to wash it all away at the moment. For the time being however rain is the last thing on our minds, this is a steep climb, the morning is warming up considerably and there’s very little air movement. Up we go with brow mopping towels at the ready. 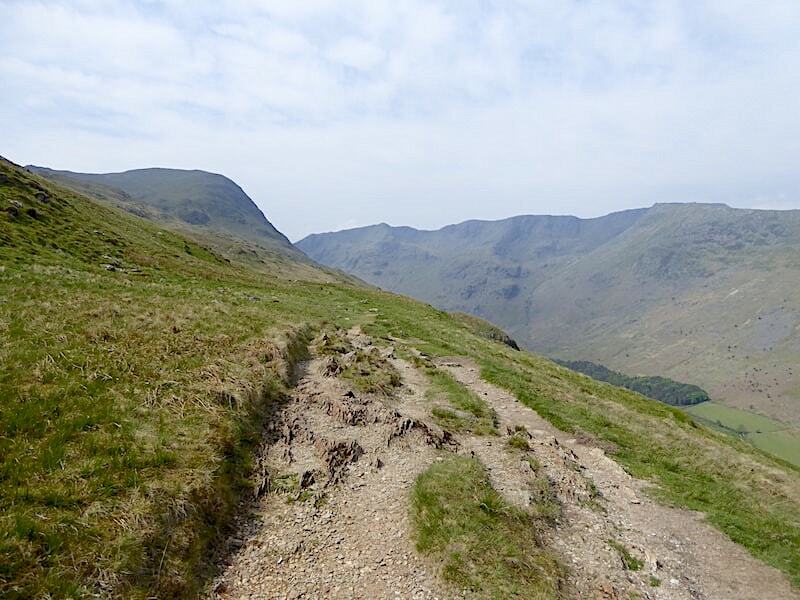 Across Grisedale we can clearly see the path leading up to ‘The Hole in the Wall’ and the beginning of Helvellyn’s Striding Edge route. We got about three quarters of the way up there many years ago but abandoned the walk when the cloud came down and we were lashed with heavy rain. Perhaps we should give it another go sometime because it was an enjoyable walk up until the rain began. A look back down the path as we begin to sweat our way up. The path gets steeper and steeper, the heat increases and so does the brow mopping. Still, the views behind us are lovely and the fragrance of the bluebells drifts around us on the barely discernible currents of air. 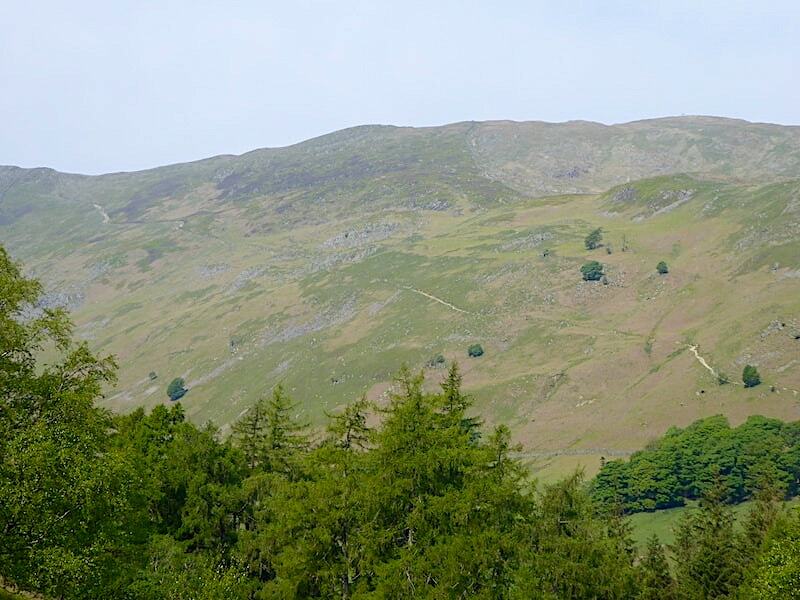 Place Fell is directly opposite us and the path we walked through the park is directly below us. 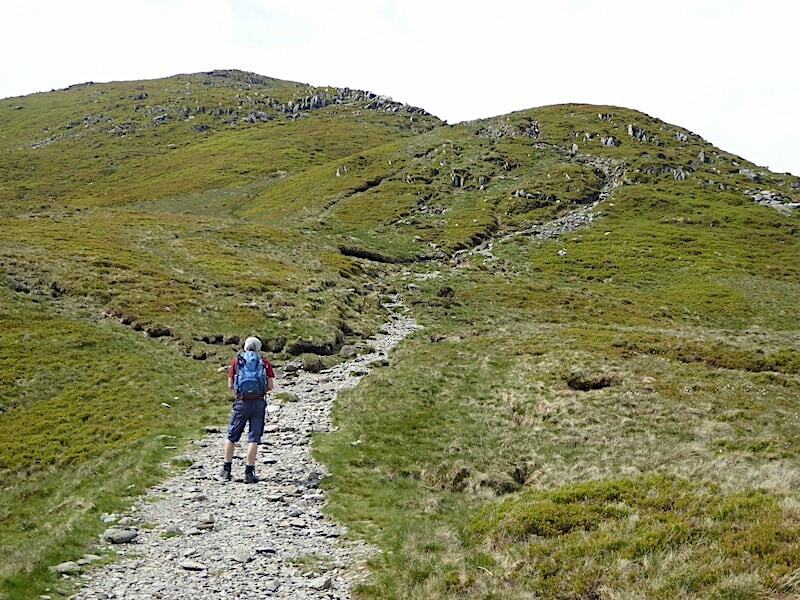 There are a couple of older male walkers on it but they didn’t turn off and follow us up here, maybe they were heading for Grisedale or even going up Helvellyn via the path I mentioned earlier. More bluebells at our feet on the grassy open slopes of Thornhow End, Keldas is over on the right and behind it is Glenridding Dodd rising up to Sheffield Pike. 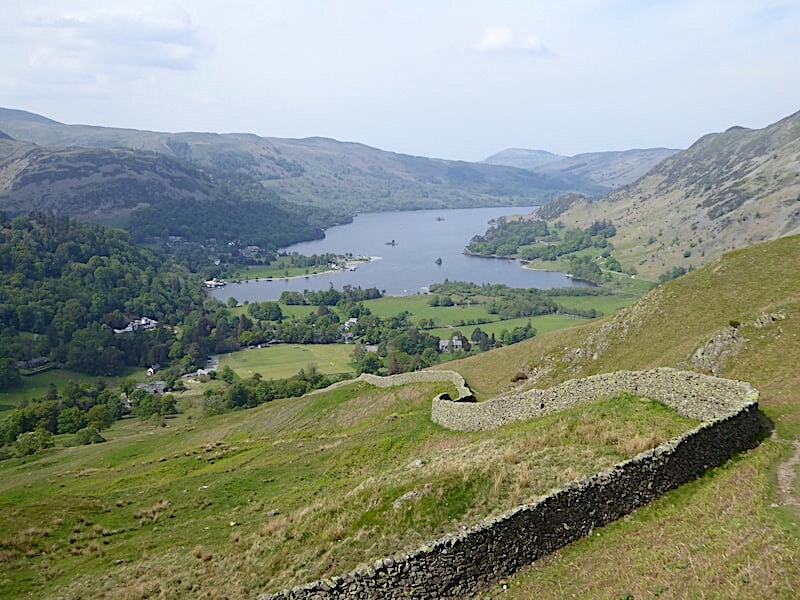 We reach a level shoulder and take a few minutes to have a look around, Glenridding village is largely obscured by Keldas, on the left, with Gowbarrow Fell, on the centre skyline, looking as though it juts out into Ullswater which of course it doesn’t. More bluebells vying for position amongst the bracken in the grass all around us while to the east of us is the clear profile of Arnison Crag with some very hazy eastern fells beyond it. Time to move on again so we turn around and begin the next section of our climb. 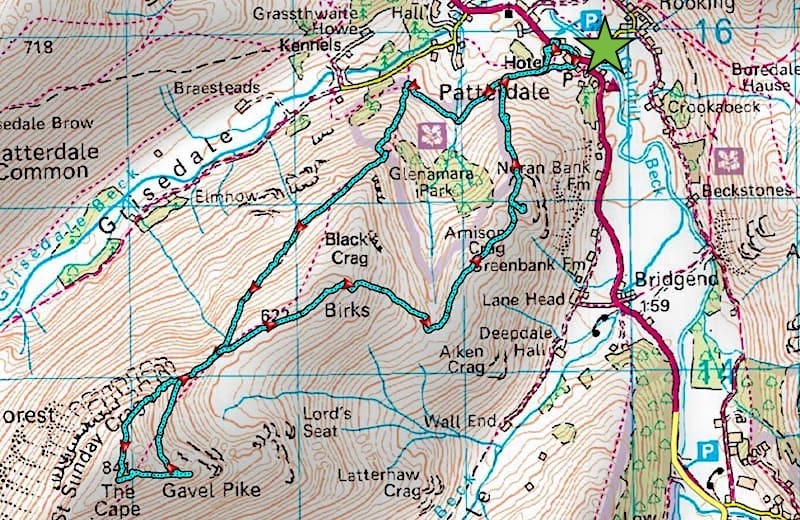 You might be able to pick out the line of the path as it rises over Thornhow End from the gate, that’ll mean a couple of brow mopping stops then. The steep climb comes to an end for us as the path levels out and traverses the slopes below Birks summit. 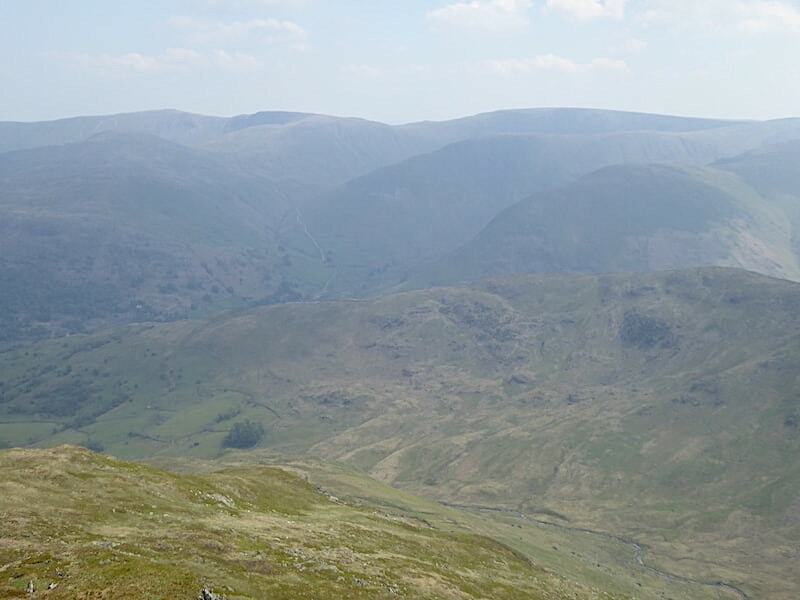 Saint Sunday Crag comes into view on the left with the Helvellyn range on the right across Grisedale. We had another stop here, not a brow mopper but definitely heat related. J decided he was much too hot in full length trousers and proceeded to unzip the bottoms and wear them in shorts mode. Naturally the lower leg sections wouldn’t come off over his boots so they had to be removed too. Starting out in shorts would have been a better choice. Be that as it may, comfort is restored and a lengthy level stretch offers the opportunity to cool down and restore equilibrium. A section of collapsed wall looked inviting so we had the Mars Bar stop just here looking back along the path we’ve just walked over. 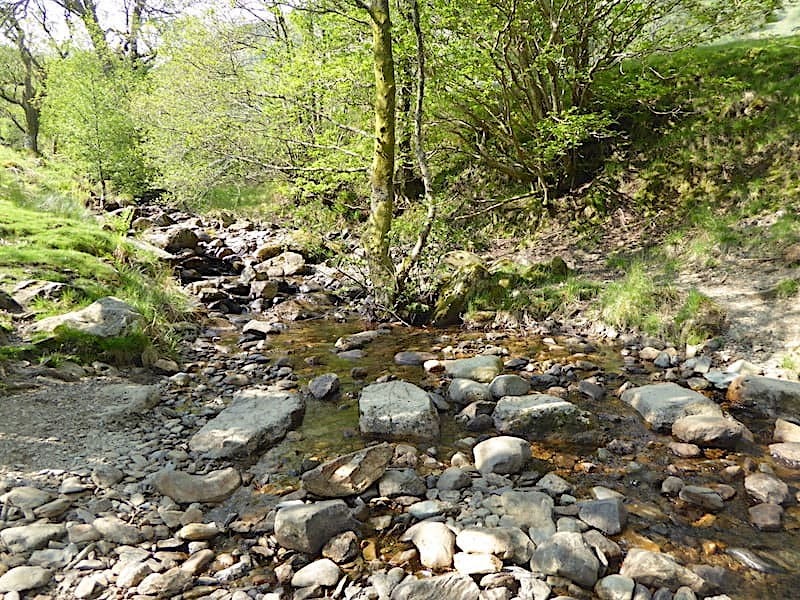 While we were here a solo walker came by, an elderly gent, walking at a steady pace, whose face reminded me of a fresh apple, very smooth with round ruddy cheeks and with whom we exchanged greetings and the usual comments about the weather. He was followed by a couple, husband and wife probably, who also had a quick chat as they passed by. Mars Bar and drinks taken on board we hoist our packs and head towards Saint Sunday Crag once more. 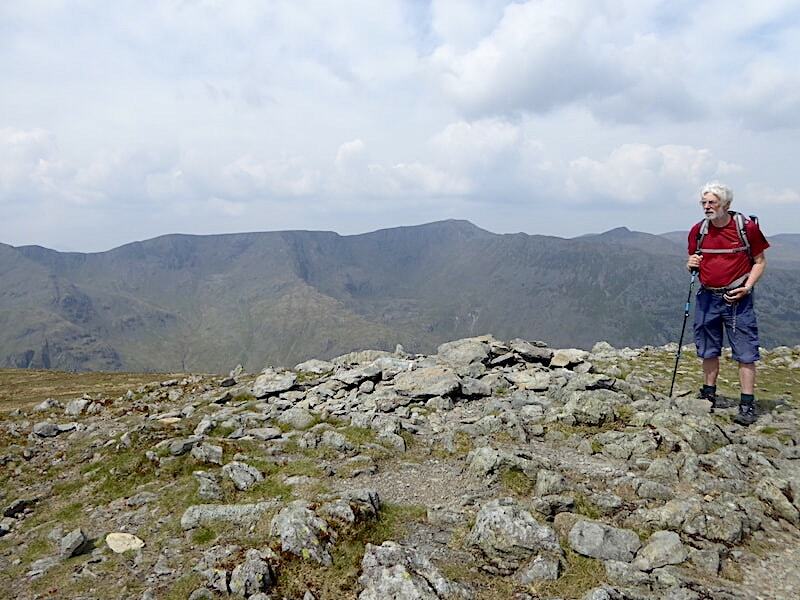 The spell of gently undulating walking is about to come to an end as we approach the north ridge of Saint Sunday Crag. 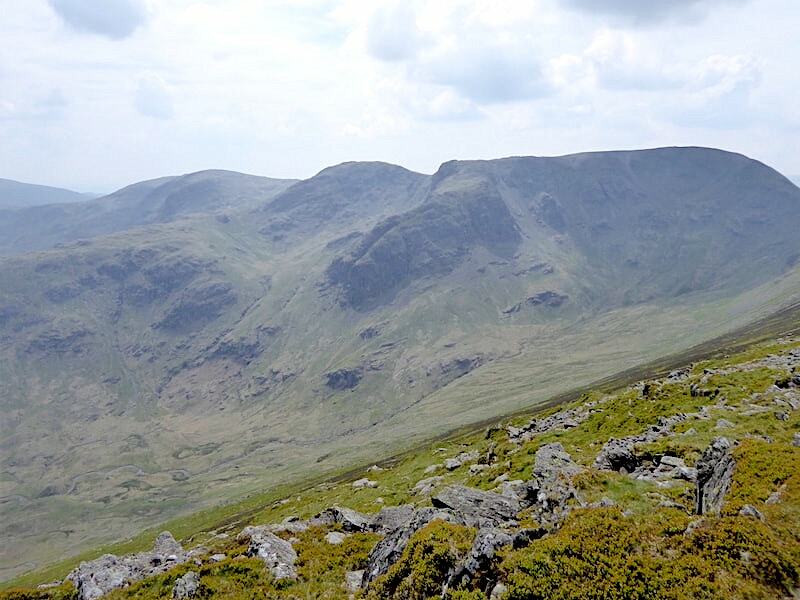 From the summit, on the right, the ridge on the skyline leads down to the subsidiary top of Gavel Pike. Much more comfortable now in the shorter length pants J surveys the route ahead and just below the crest of the first rise we can see the couple who passed us earlier have now also stopped for a break and have found themselves a nice little viewpoint on one of the outcrops. They are still enjoying their tea/coffee break when we reach them and once again we have a brief chat. The climb up through the outcrops didn’t give me a great deal of grief, vis a vis my back problem, it was quite a narrow track with plenty of short step ups so there was minimum pressure on the back muscles. We’re almost at the top of the final rocky section of the climb so I took a look back at the view before we lost it. 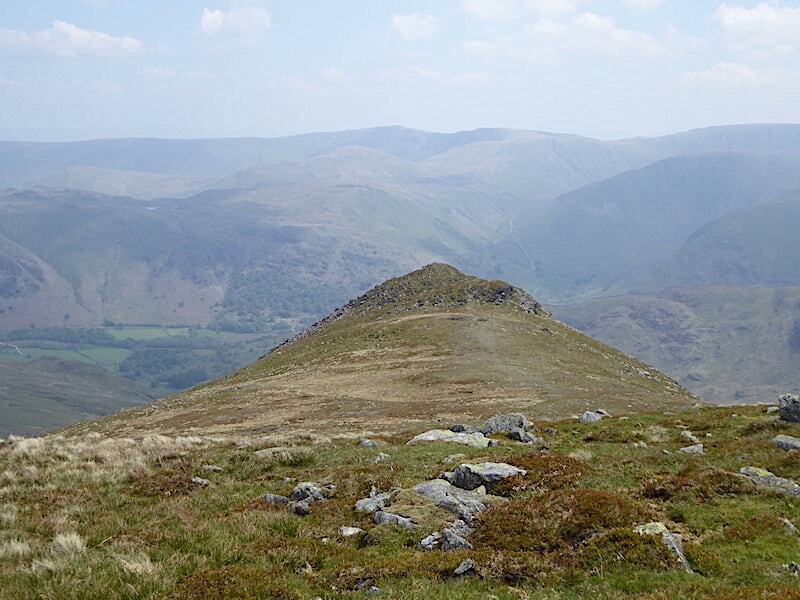 On the right is Birks quite a way below us, beyond which is Place Fell. 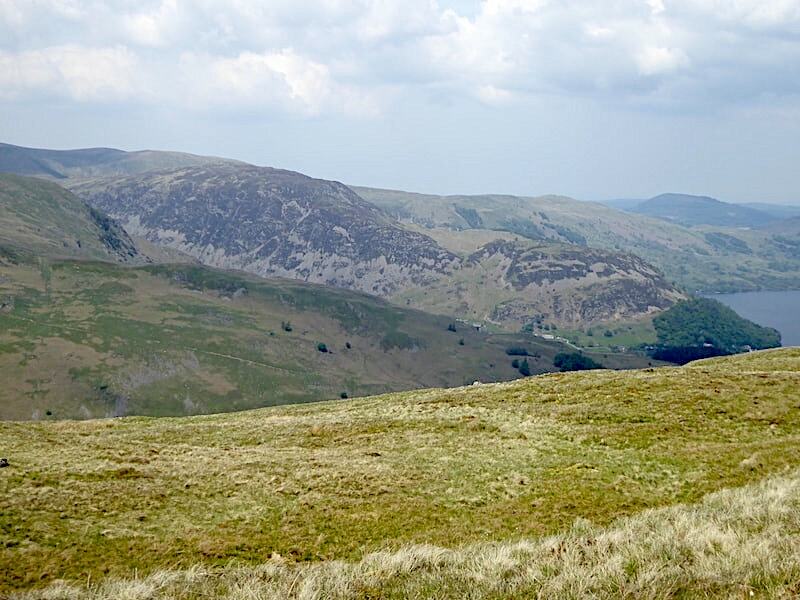 On the left are the green fields of Grisedale and the slopes of Patterdale Common. We have also just passed the elderly gent who came by us at our Mars Bar stop, he was also sitting taking refreshment on board and enjoying the view before continuing on up to the summit. Being much higher we now have the benefit of a little more breeze which is hugely cooling and refreshing. Beyond the outcrops all that’s left to negotiate is the steady pull up the wide and stony track across the grassy slopes below the summit which isn’t yet in sight. 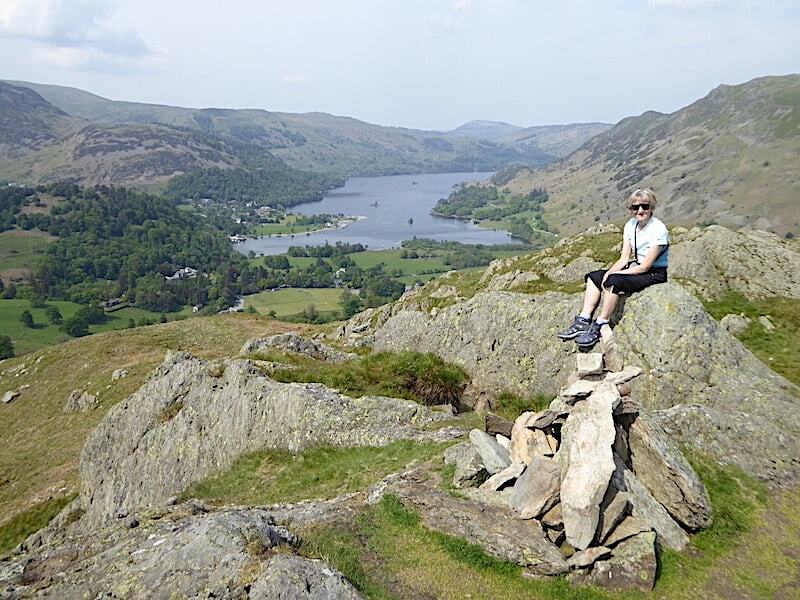 That’s not the summit either, just keep going until the land stops rising …..
….. and the rocky top of Saint Sunday Crag appears. 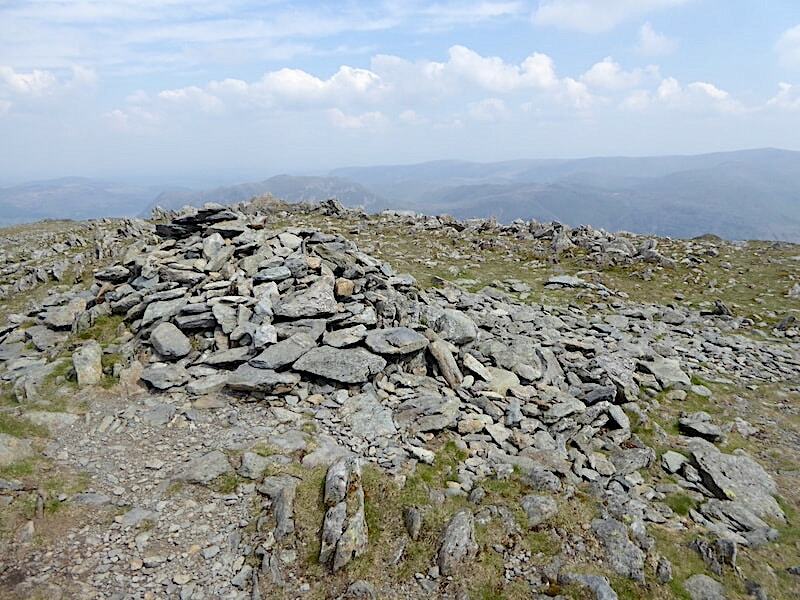 A loose arrangement of rocks and stones perched on one of the outcrops seems to serve as a summit marker. 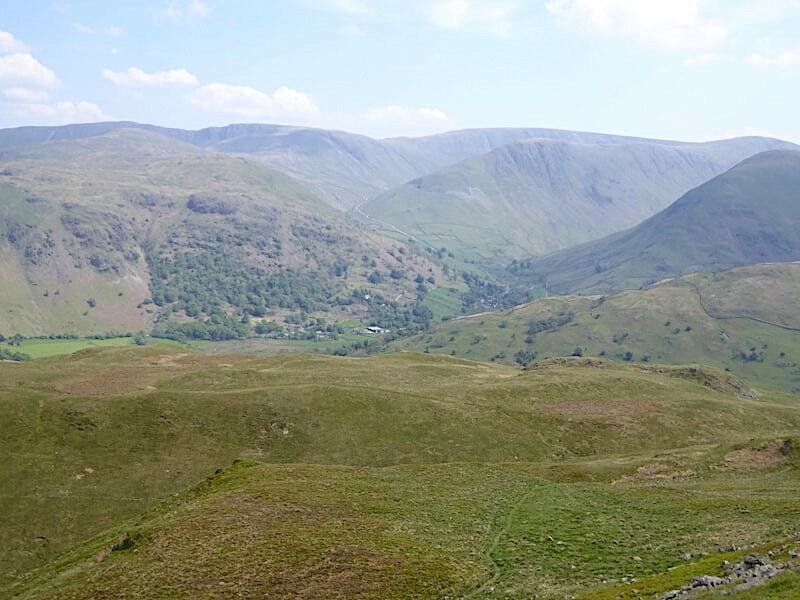 Across the Grisedale valley is a splendid view of Dollywaggon Pike, Nethermost Pike and Helvellyn. 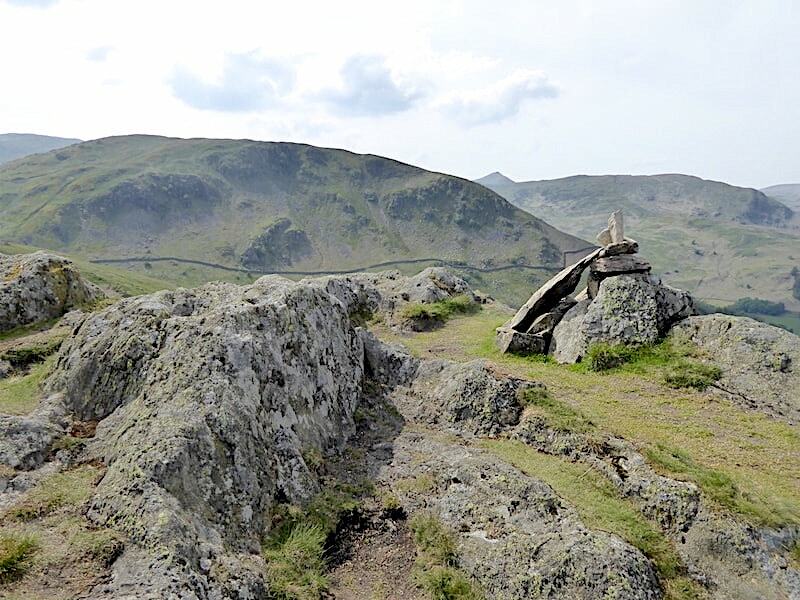 Their dramatic eastern slopes towering above Grisedale have been in our view from the moment we began following the path below the summit of Birks, and there are some hugely impressive rock formations along the whole length of the range. 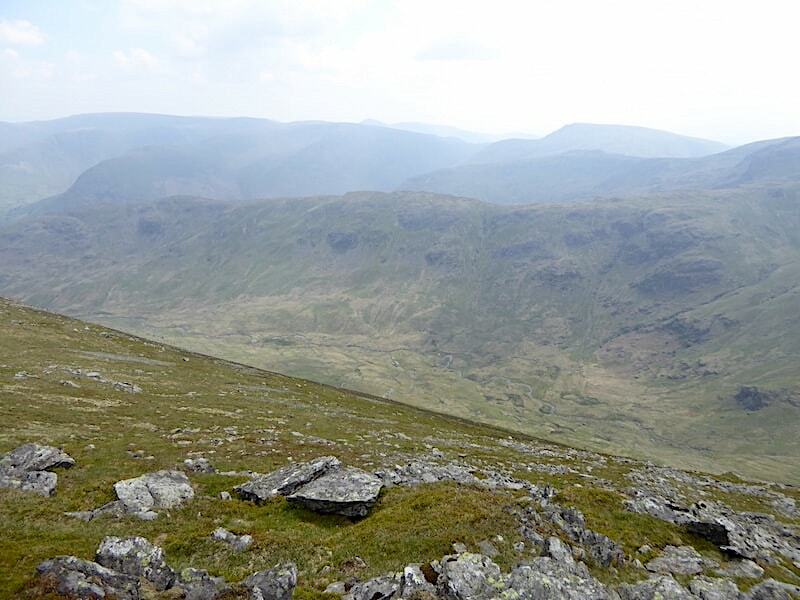 Looking southwest from the summit along Saint Sunday’s ridge which gradually drops down to Deepdale Hause, at which point there are a number of options. Turning east at the hause would lead you down into Deepdale, turning west takes you down to Grisedale Tarn and even more choices of route, while continuing straight on would lead steeply up over Cofa Pike and on to Fairfield, the huge bulk of which is over to the left of the shot. 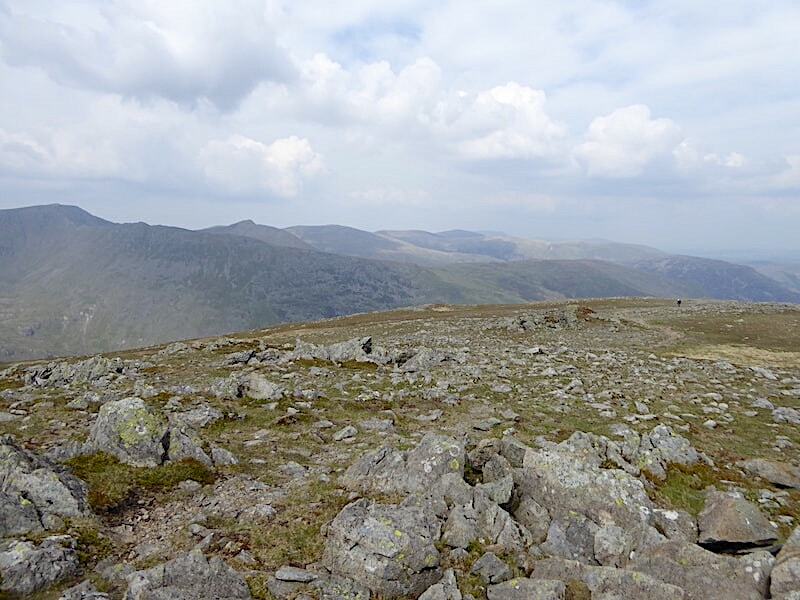 Looking westward at Nethermost Pike and Helvellyn, with the pointy top Catstycam just peeping up to the right of them. Another jumble of stones and rocks forms another cairn just a short distance away from the first one. The haze is quite thick today so the distant views were very indistinct. At the moment we have the top to ourselves …..
….. but by the time we had taken in the views and I was about to take this shot, looking to the northwest, the pair of walkers I mentioned earlier had just arrived. The solo elderly gentleman is just arriving too, he’s the tiny black speck on the path over to the right. 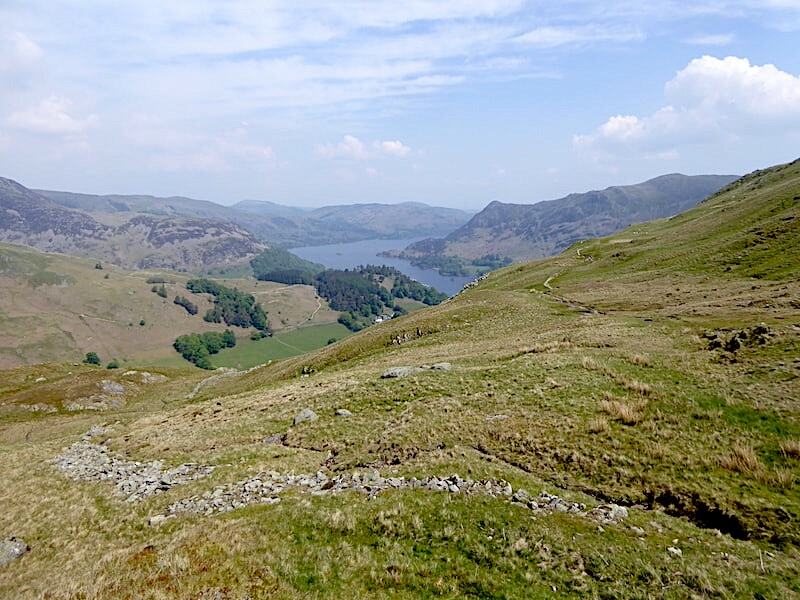 We leave the other walkers to enjoy their summit time and drop down a short distance to find a suitable spot to have a break and tuck into our lunch. There’s no shortage of rocky hollows to settle down in and there was no shortage of flying beasties either, there were clouds of them. We managed to find a spot which was relatively free of them and settled down to a largely trouble free picnic. Across Deepdale our view is of Dove Crag, Hart Crag and Fairfield but even at such close quarters their features are indistinct thanks to the hazy conditions. Lower down Deepdale we have a view across to the long ridge of Hartsop above How with the ridge of High Hartsop Dodd right behind it. 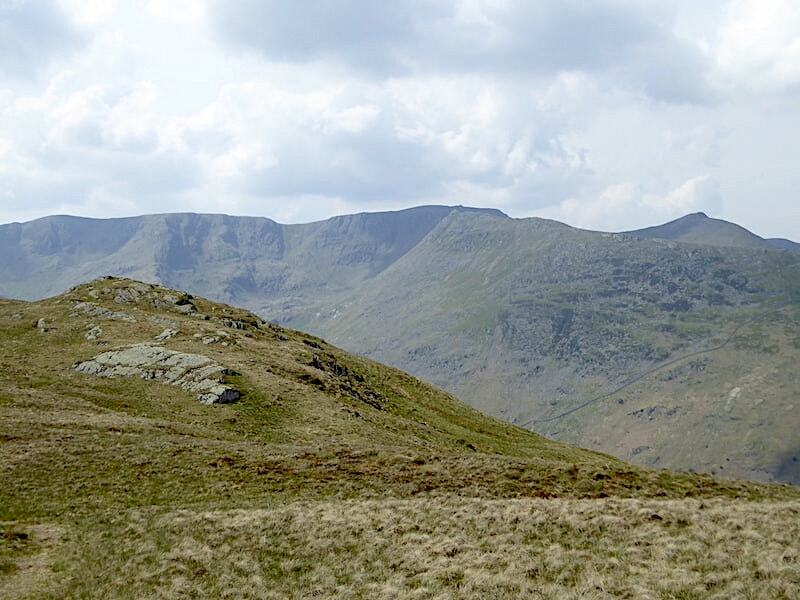 Red Screes features on the right skyline with High Street on the left one. Not a good day for long distance views. 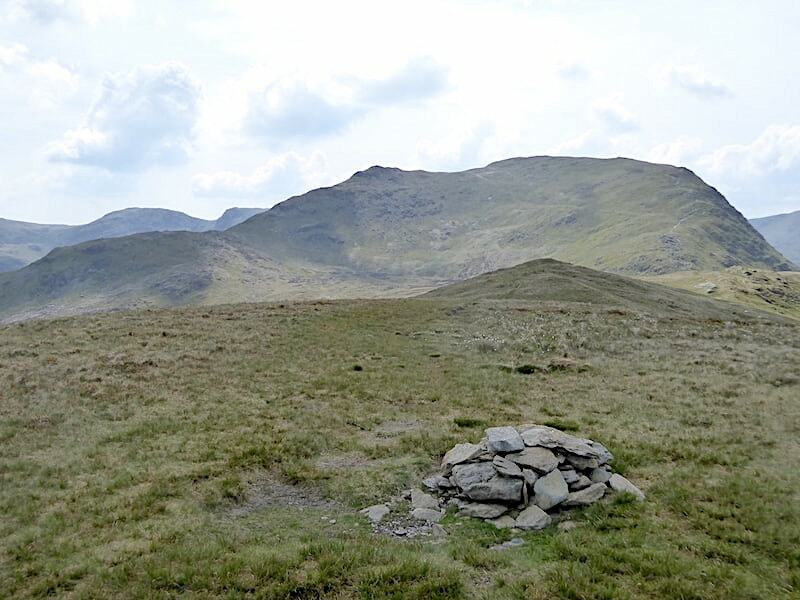 After our break we continued on down to Gavel Pike which on a less hazy day would provide some wonderful views of the fells to the east across Patterdale. 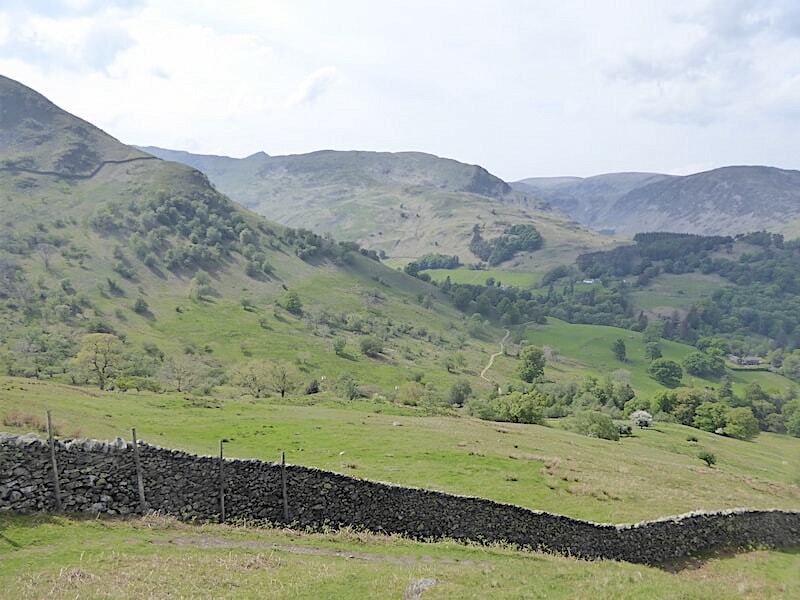 A spell of sunshine as we made our way down which highlighted the individual features of Dove Crag, Hart Crag and Fairfield a little more with Greenhow End standing out much more clearly now. 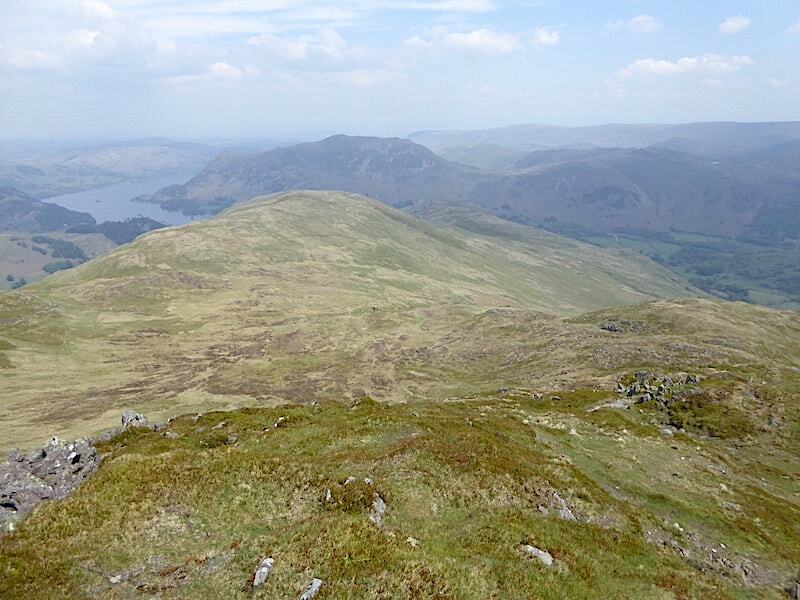 A short walk down soon brings us to the top of Gavel Pike from where I took this view of the grassy slopes of Birks below us with Ullswater and Place Fell beyond. 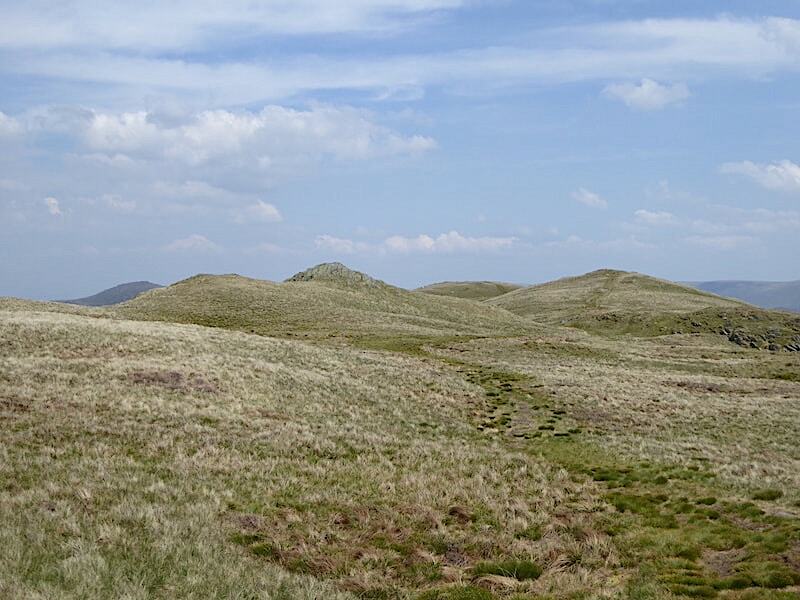 The haze seemed to get worse during midday so the views were very poor with most of the eastern fells simply merging into each other …..
….. and providing very little other than a vista of greyish green mounds. 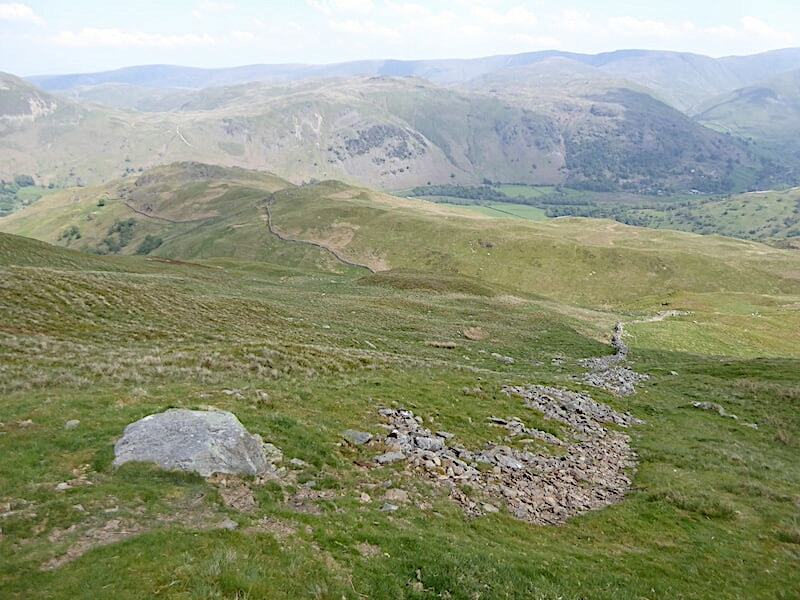 A view back up to the summit of Saint Sunday Crag before we left Gavel Pike. 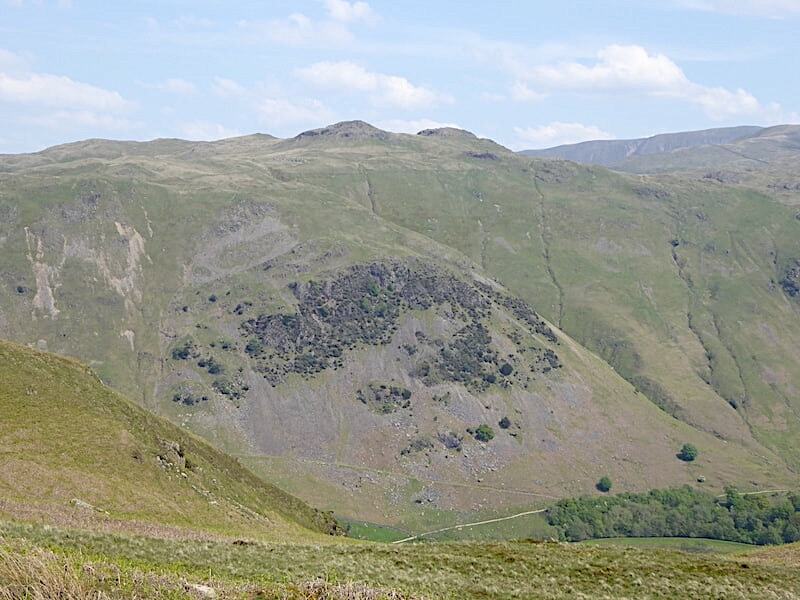 The ridge, with its cluster of false tops, dropping down to Deepdale Hause can be seen on the left with the steep slopes of Fairfield rising up from the low point. Seat Sandal is peeping up above between the two. We leave Gavel Pike under a hefty cloud patch and make our way across to join the path on the slopes below Saint Sunday’s northeast ridge. Single file only along here as we head down to pick up the path to Birks. 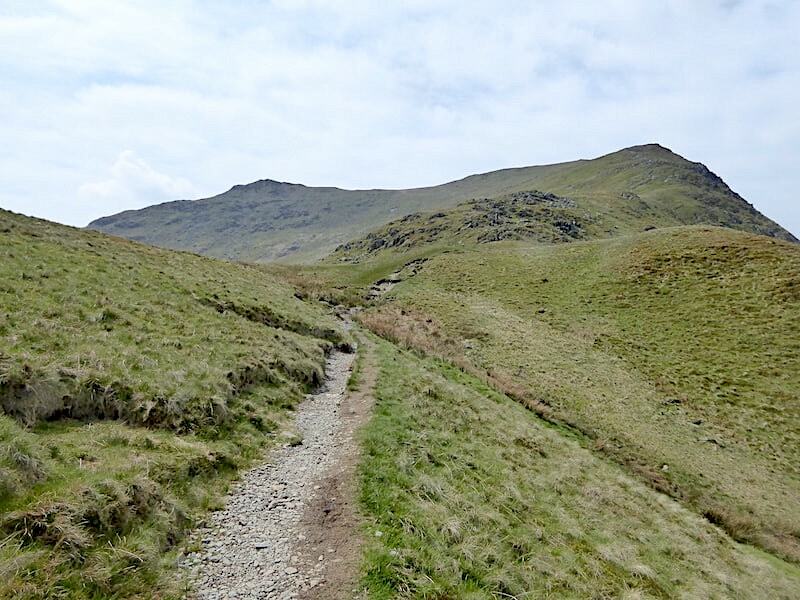 We leave the main path here and branch off to the right across the grassy slopes of Birks. Very easy and straightforward walking but now we’ve lost the height we’ve also lost the slight breeze creating very warm and muggy conditions. 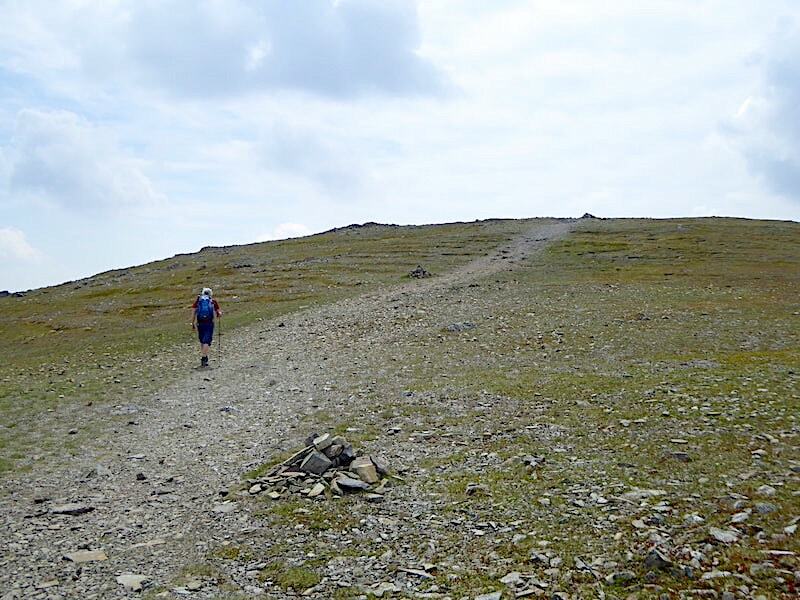 There’s nothing difficult or steep about Birks from this approach so it was a quick and easy tramp across to the summit. 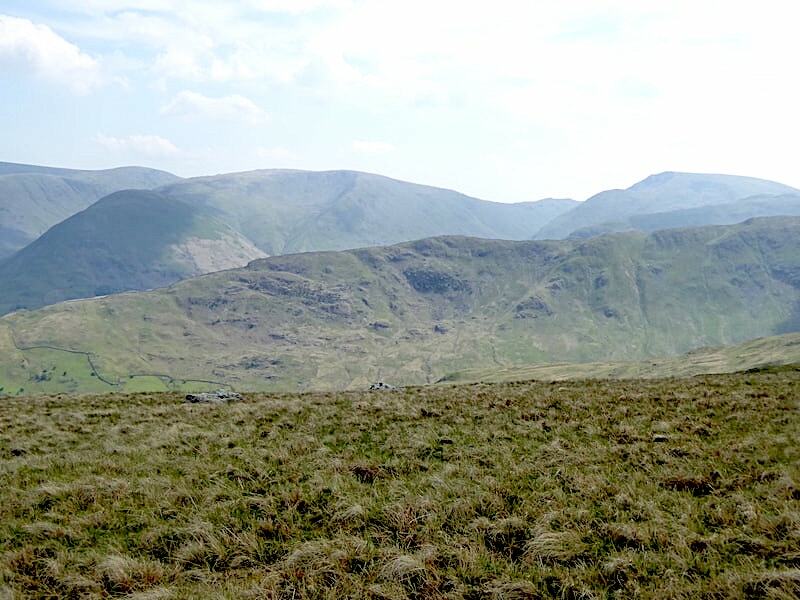 Sheffield Pike and Glenridding Dodd are back in view across Patterdale Common, with Watermillock Common and Great Mell Fell beyond them. 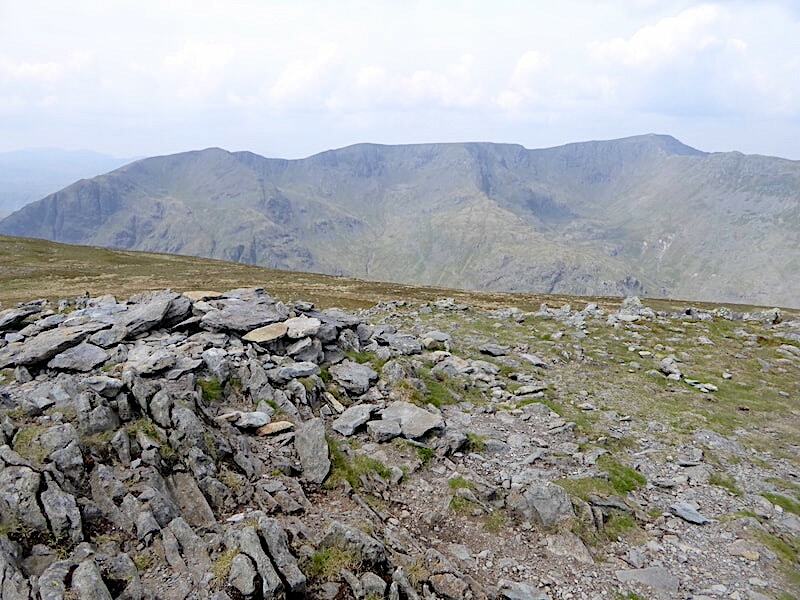 A look back at the Helvellyn range and Catstycam as we walk across Birks. 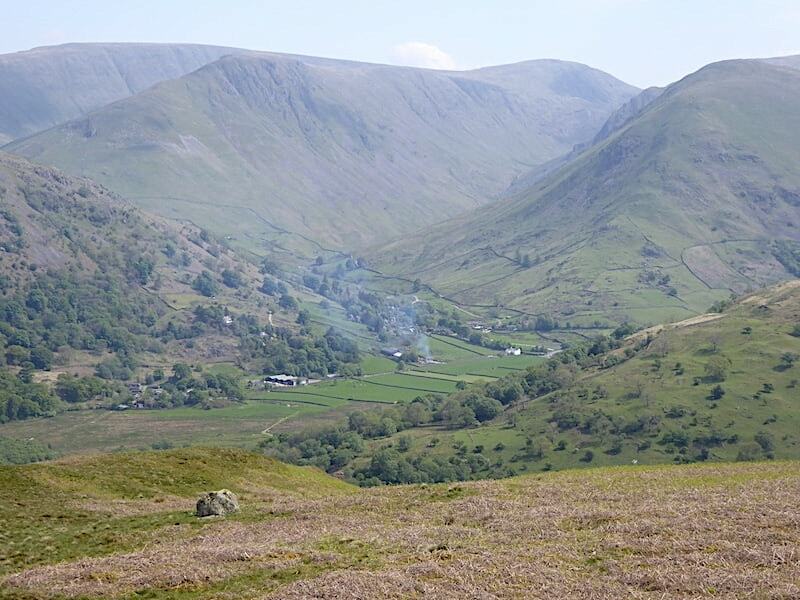 A close up of Hartsop village …..
….. and not so close up. 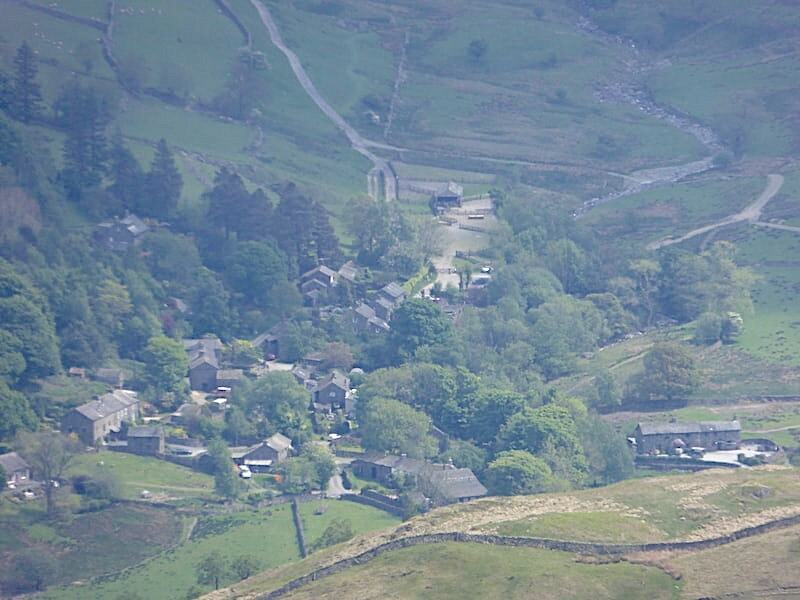 The haze seems to have thinned a little so we can see Gray Crag, behind the village, a little more clearly. High Street is right behind it on the skyline, while the fell in shade on the right is Hartsop Dodd where we were a few days ago. 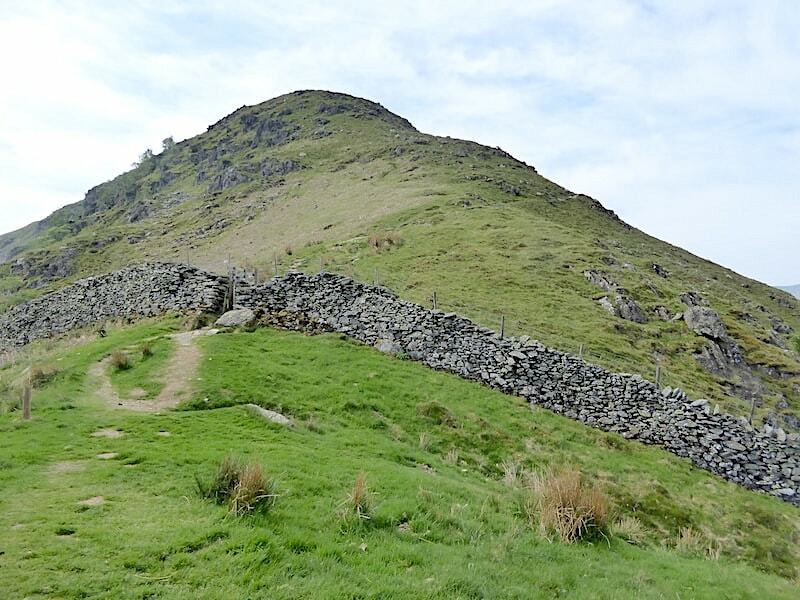 We didn’t approach it from Hartsop village though its much too steep a climb for me and my various aches and pains at present. 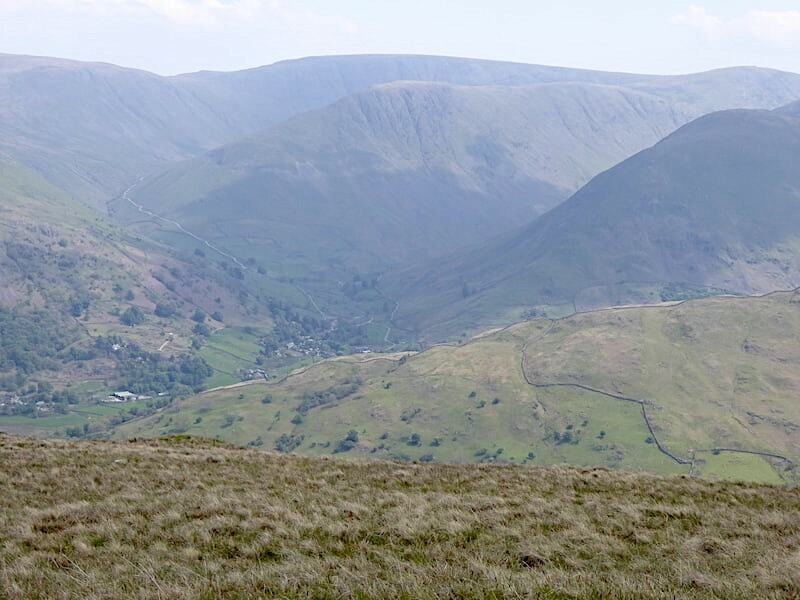 The sunlight helps to cut through the haze once again so the Hartsop above How ridge is more clearly defined, and Caudale Moor’s northern ridge, just left of centre, is also easier to identify. 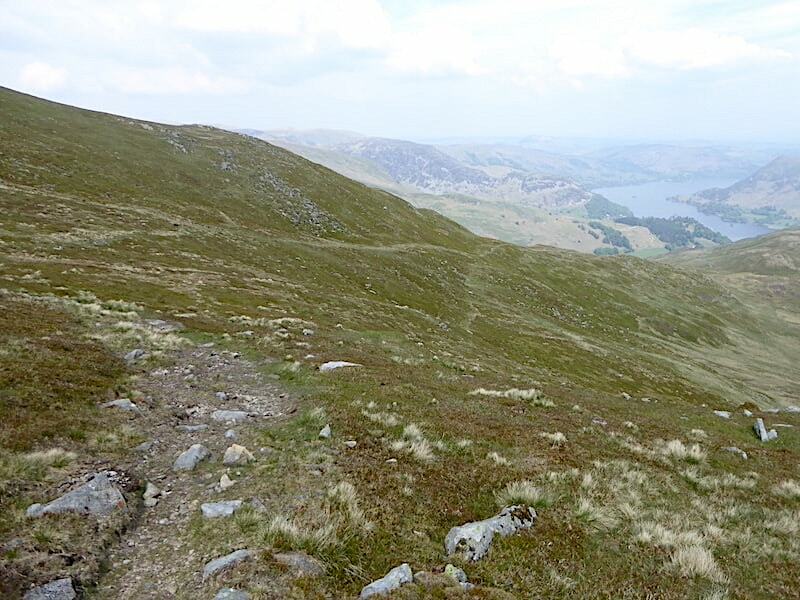 The view back to Saint Sunday Crag from the summit of Birks. 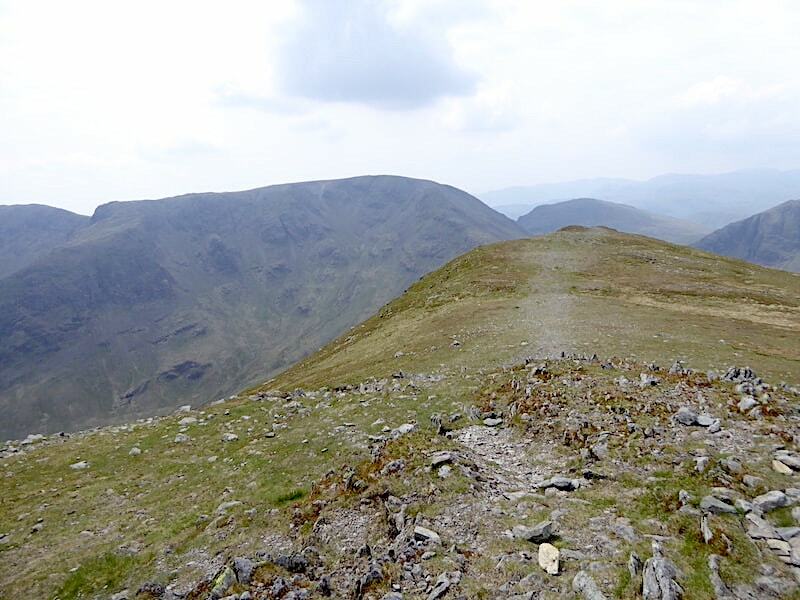 The path we followed up the northeast ridge is clear to see, as is part of the route we followed down from Gavel Pike. From the summit we leave the main path and follow the broken wall down to Trough Head. 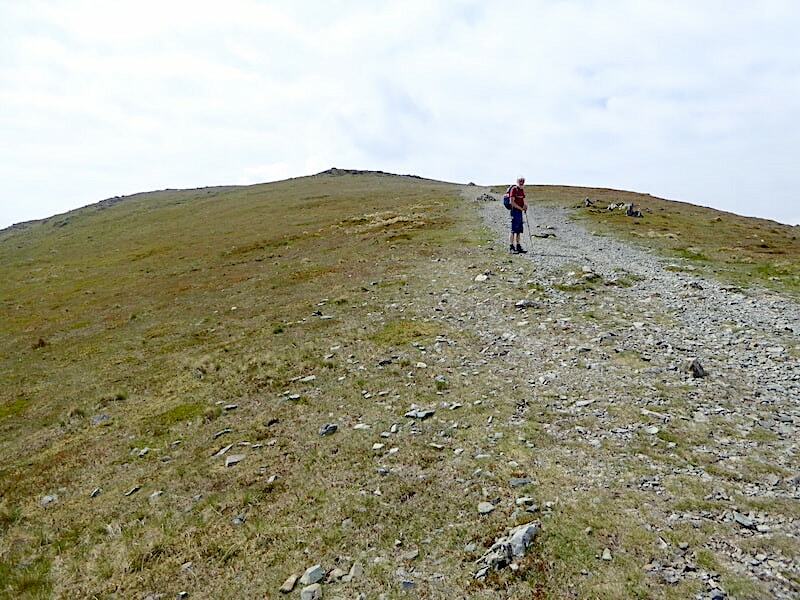 This is a steep descent, which will feel even steeper when used as an ascent route, but there are no difficulties. 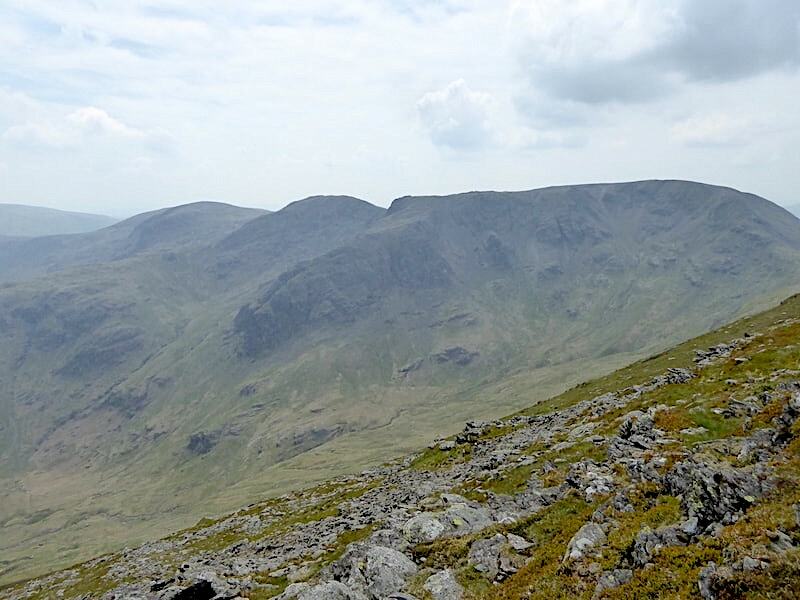 The long green ridge stretching below us is the route across to Arnison Crag. 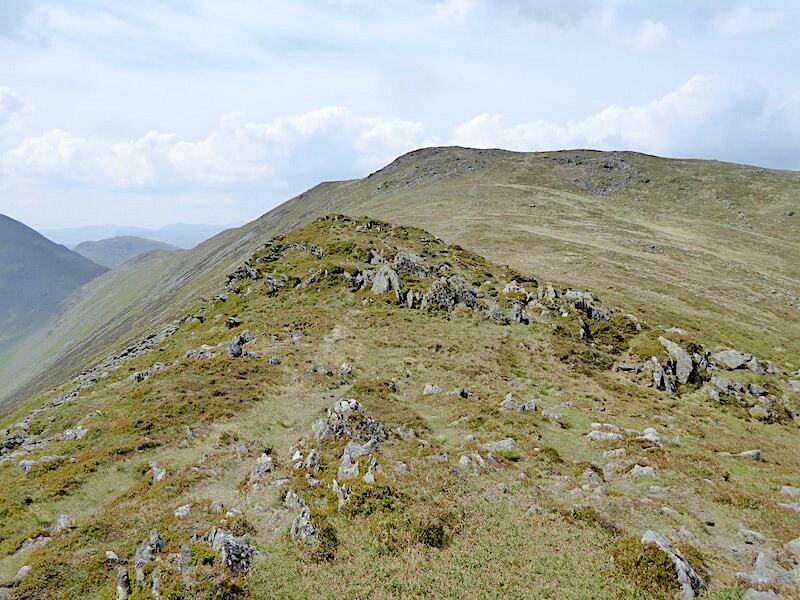 Lo and behold, as we make our way over to Trough Head, the eastern fells are lit by a sunny spell, the haze is much thinner and colours and features are a whole lot more distinct than they have been so far. 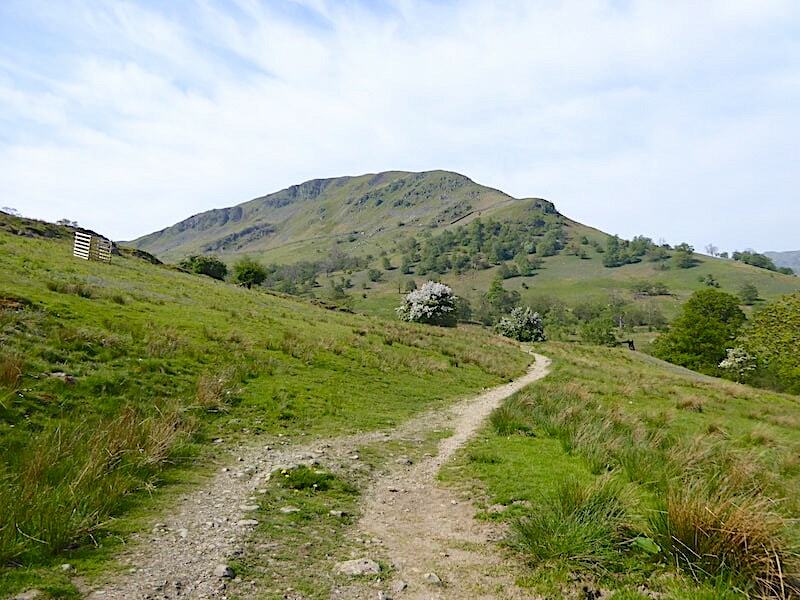 Hartsop village is nestling below the tree lined slopes of Lingy Crag, and Gray Crag and Hartsop Dodd have finally emerged from the murk. 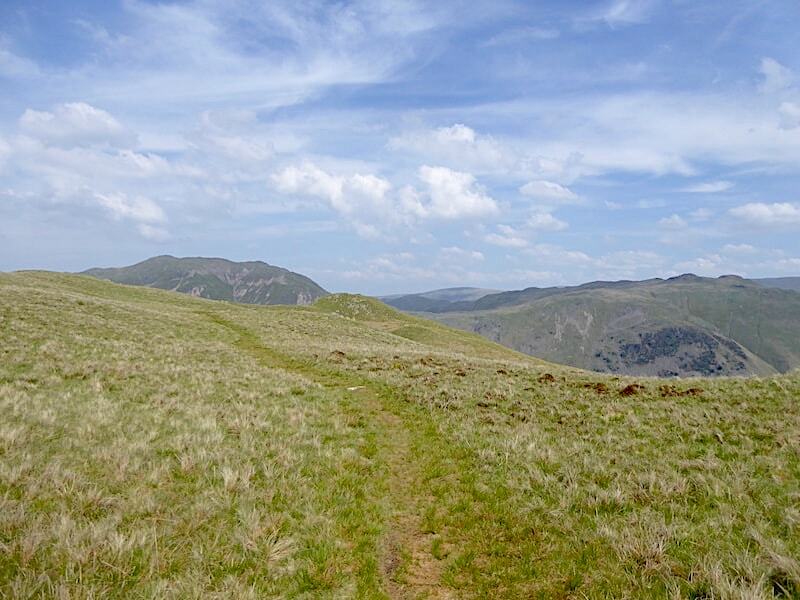 We cross Trough Head and make our way across the bone dry grassy undulations to Arnison Crag. Smoke drifts lazily away from someone’s bonfire in Hartsop, and the steep rise of the Hartsop Dodd ridge becomes more clearly defined, as does the similarly steep ridge route up Grey Crag. Angletarn Pikes on the skyline, I bet Angle Tarn was a popular destination today. The thought of dipping my toes into Angle Tarn was very appealing right now because my feet were so hot they felt as if they were on fire. The rest of me was comfortable, bare arms, bare legs, body heat able to evaporate. Not so simple with socks and boots on, they’re encased in their own little ovens with no escape route for the heat. 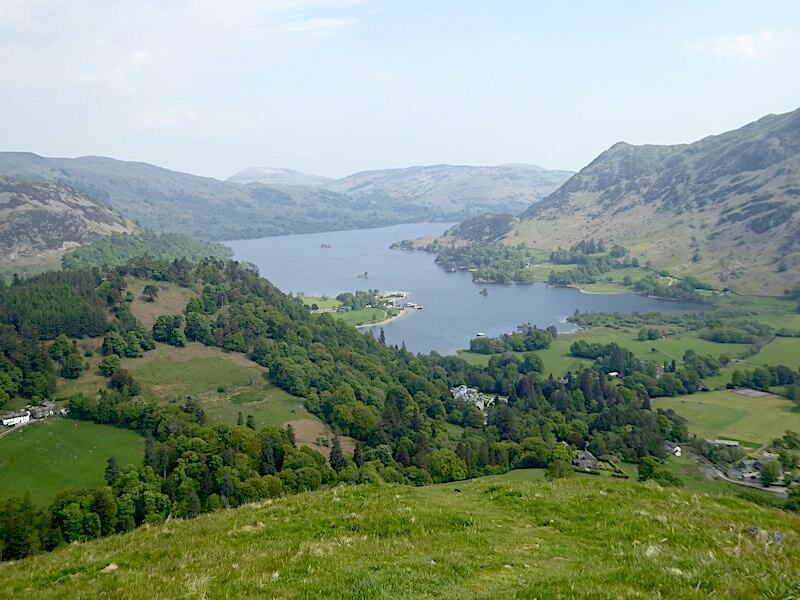 The lovely view along Ullswater from Arnison Crag. The weather has been so dry recently that the tarn below the top had dried out so no chance of a cooling paddle there. Shortly after this shot the socks and boots came off and I padded about on the grass just to cool things down a little. There wasn’t a lot of moisture in the grass but what there was provided a welcome foot spa for a while. 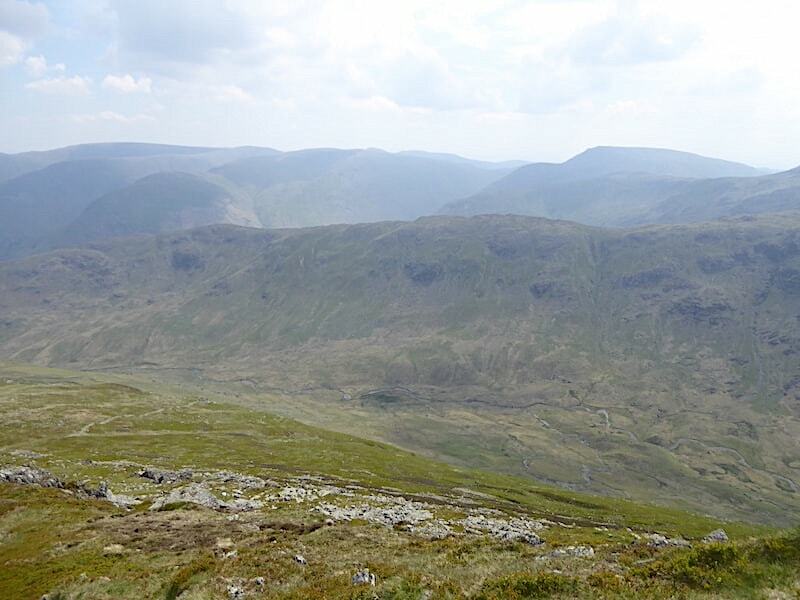 The view across to Birks from Arnison Crag, with Catstycam just peeking out behind Birkhouse Moor. With feet feeling more comfortable socks and boots are put back on and we follow the path alongside the wall and begin our descent of Arnison Crag. 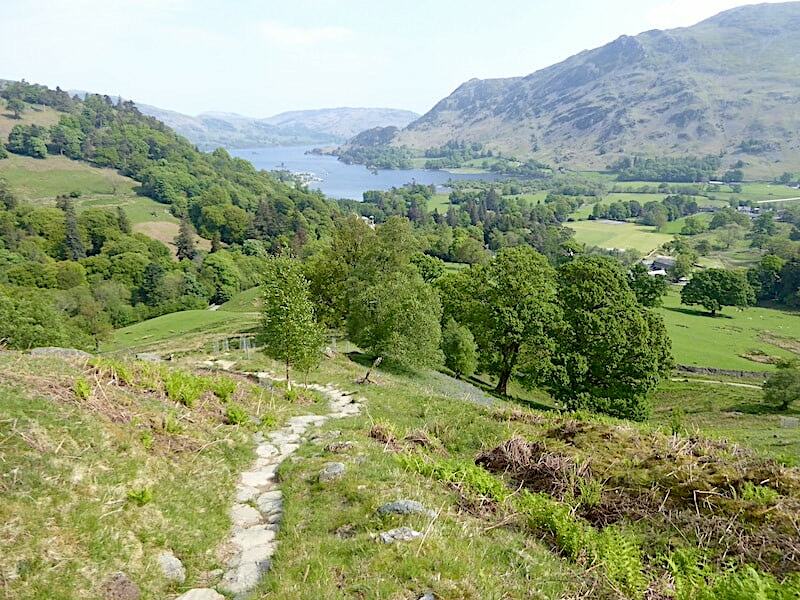 Its a warm and sunny day, its downhill all the way, and the lovely view ahead stays with you all the way down, a lovely way to end a walk. On our left is the path through Glenamara Park which we used on our outward leg this morning. The wonderful view from the top of Oxford Crag. Rounding Oxford Crag and making our way back down to the handgate we passed through this morning. 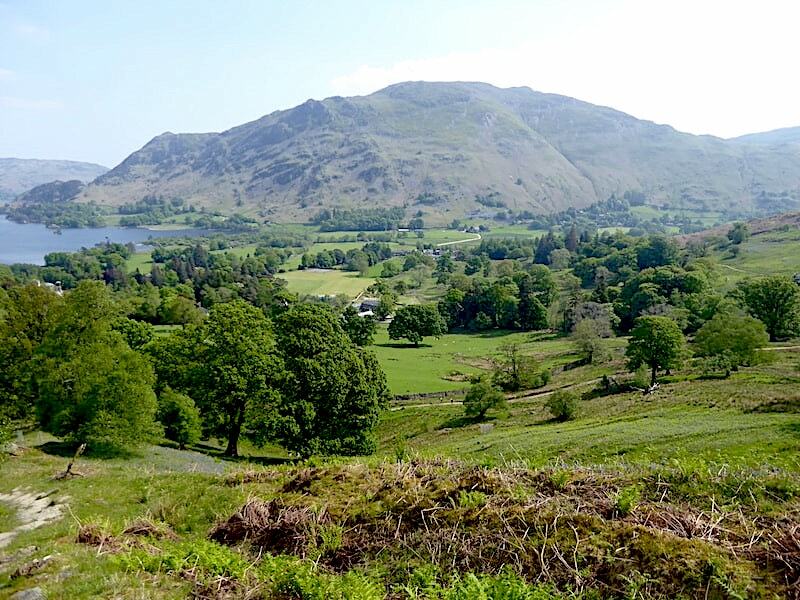 From there its a short stroll through the trees where we emerge …..
….. in the back yard of The Patterdale Hotel where the sight of this old pump took me straight back down memory lane. I haven’t seen one of these since I was seven years old, and that’s a heck of a long time ago. My grandfather had an allotment in our little Yorkshire village and I would often go there with him at weekends or school holidays. He would tend to his veg and flowers and I would just wander around with strict instructions not to pick or eat anything. 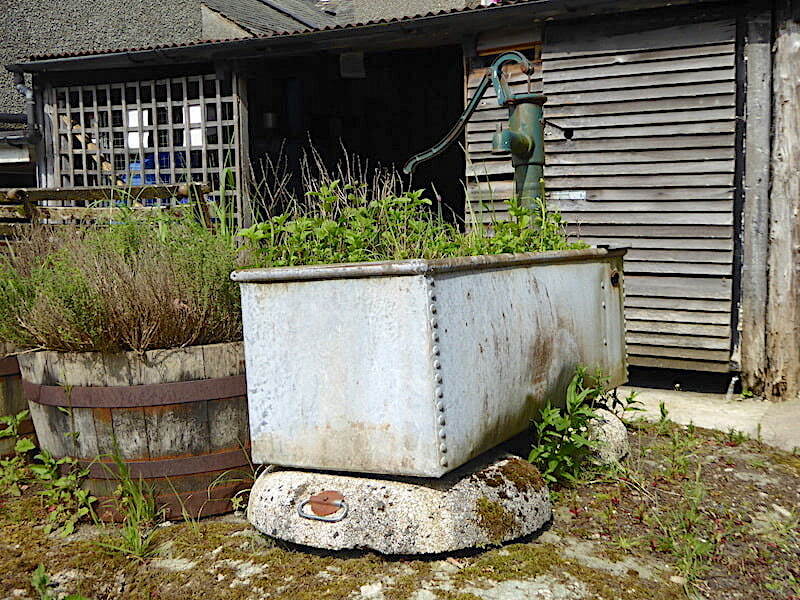 He had a pump just like this one which was attached to a large wooden barrel in which rain water was collected. I would pump the handle while he held his rusty old watering can underneath and then off he would go and do the watering. I would then go and explore all the little nooks and crannies and inspect all the produce he was growing, it was a magical place for a seven year old, full of hidden corners with a lop-sided old shed, a greenhouse whose warmth always surprised me, a couple of compost heaps dotted around and any number of ancient gardening implements whose functions were unknown to me. On the way to or from the allotment he would always meet someone he knew, it was only a small village so everyone knew each other, and the conversational exchanges always started like this – “Na then Charlie, ‘ows ta doin?” Charlie, my grandad, had three stock replies – ‘fair’, ‘fair to middlin’, and ‘middlin’. As far as I was concerned he was never any different either in his health or general well-being but those three description obviously conveyed a wealth of information to the other person and having established that things were either OK or not so OK the conversation would carry on from there. Often for quite a while, with me wondering when I might eventually get home for my tea. That was a time when life was simpler, nobody had a car or a phone, the coalman had a lorry, and also a coach for day trips to the seaside in the summer, and the farm next door to us still used enormous shire horses to pull their flat bed carts. Kids had to behave because everyone, including the village bobby, knew where you lived and who your mother was. If we were ever spotted doing anything we shouldn’t there would be a warning to that effect and with none of us daring to answer back we would silently disband and skulk off home, fervently hoping that there wouldn’t be a knock on the door a bit later on. Another world completely, and one that has gone forever. I haul myself back from the trip down memory lane and …..
….. back to the real world where we were both ready for a cooling drink which the liquids in our packs couldn’t quite provide having been out in the hot sun all day. 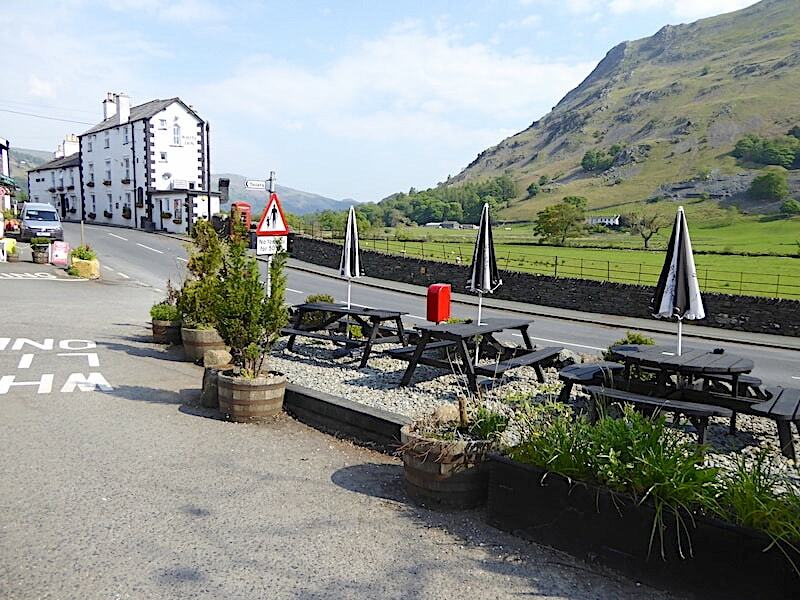 As we had emerged at the Patterdale Hotel we stopped off there, purchased the much needed beverages and sat in the sunny garden to enjoy them. Very nice it was too. All that was left to do was to cross the road and return to the car park, the opening to which is out of shot in the wall on the right. A grand day out.